It all started on December 19, 1970. Elvis had got into a heated argument with his wife Priscilla and his father Vernon when they confronted him on spending habits. 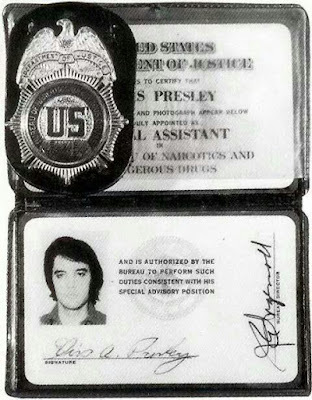 Upset and feeling confined in his Graceland home, he left his home for the first time alone since he was 21 years old. He boarded a flight and went to Washington D.C. 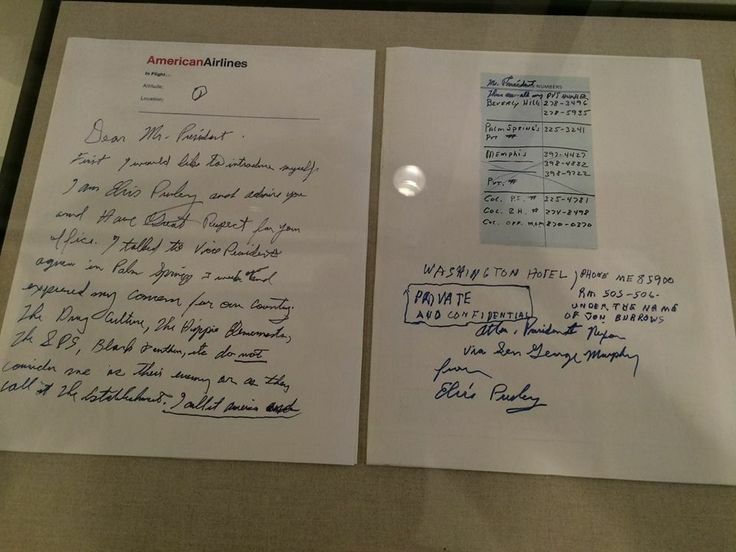 He checked himself into the Hotel Washington but then flew to Los Angeles to visit his friend Jerry Schilling. At the time Elvis had an eye infection and was taking medication. 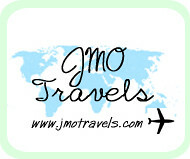 He had an allergic reaction to the medication which was aggravated by chocolate that he ate on the plane. When he arrived in Los Angeles a rash had developed on his face and neck. Seeking refuge with Schilling and after seeing a doctor and getting some sleep, Elvis told Jerry that he wanted to return to Washington D.C. He also arranged for Sonny West (one of his body guards) to meet them there. On the plane ride back to Washington, Elvis met California Senator George Murphy. 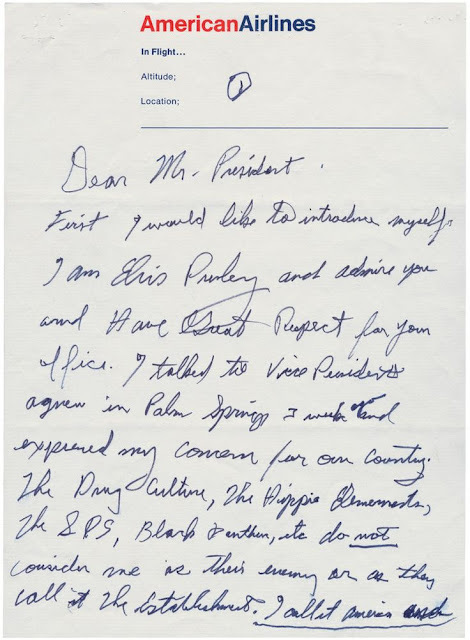 He told Senator Murphy that he was interested in acquiring a Bureau of Narcotics and Dangerous Drugs badge. 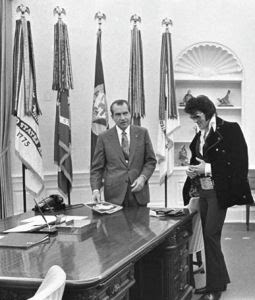 The Senator suggested that Elvis write to President Nixon offering his services to help combat illicit drug use with youth. Elvis thought this was a brilliant idea and immediately wrote a letter on the plane. Once they landed he hand delivered it to the White House at 6.30am on December 21. A few hours later Elvis visited the Bureau of Narcotics and Dangerous Drugs headquarters and met with Deputy Director John Finlator. 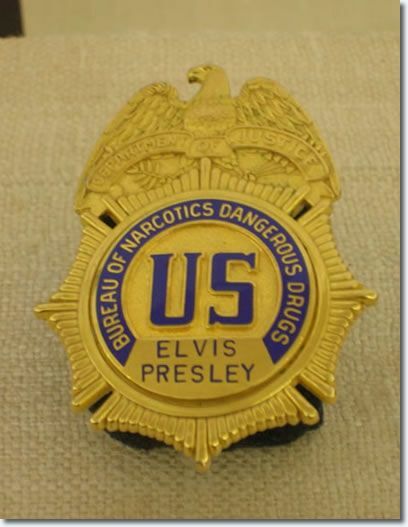 Elvis was unsuccessful in persuading Finlator to give him a BNDD badge. While at the hotel, Jerry received a call from Egil Krogh, President Nixon's deputy counsel, to arrange a meeting between Elvis and Nixon. 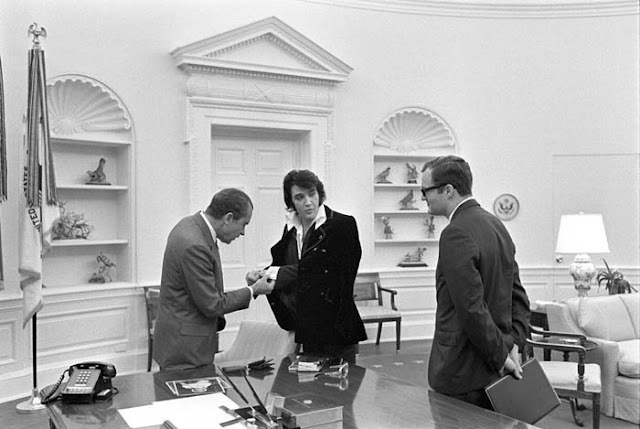 Elvis immediately picked up Jerry and Sonny from the hotel and made their way over to the White House. 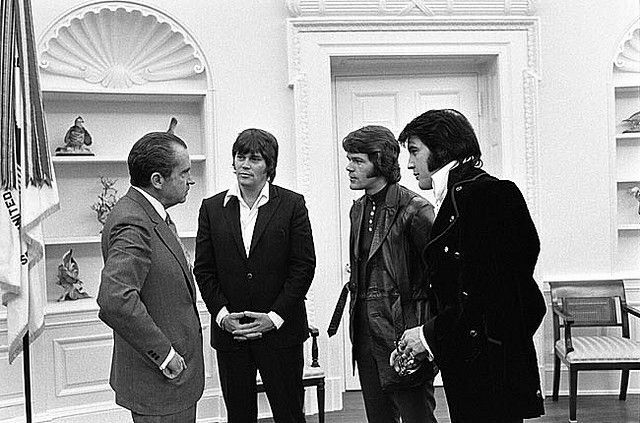 All three of them were immediately accepted into the White House and met President Nixon. Elvis persuaded Nixon to give him a BNDD badge, and after an official photograph was taken, the trio left, with Presley returning to Graceland the following day. 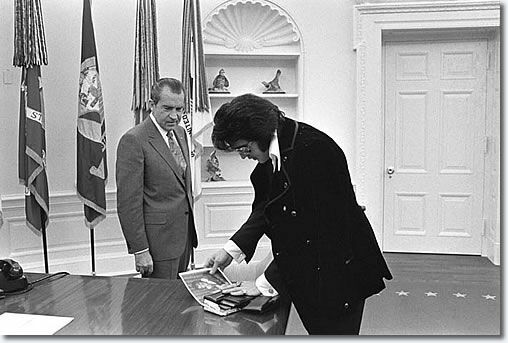 Elvis signed photographs for the President and also received gifts from the White House. Elvis got exactly what he set out to do. He met the President and got the badge that he so wanted. 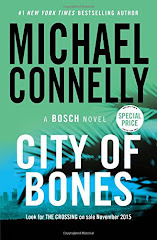 He offered up his services to be an Agent at large. 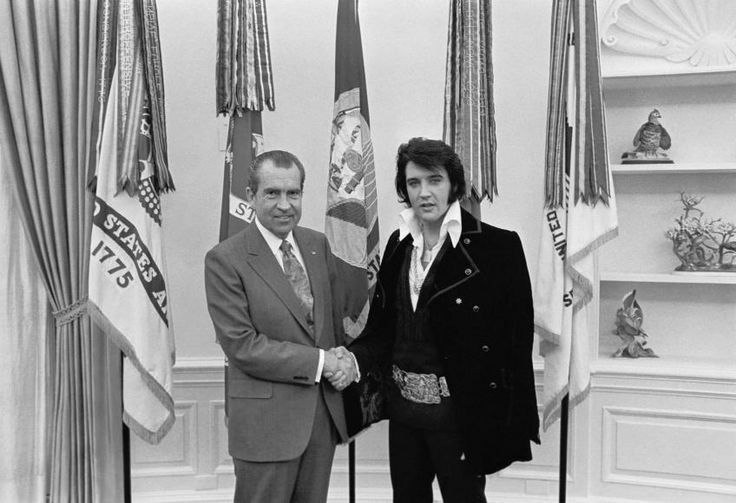 It is said that Nixon met with Elvis to try to appeal to a younger audience. Crazy shenanigans, indeed! What a bizarre tale. I can understand why Nixon would've wanted to appeal to a younger audience, but it's still such a strange, interesting tale. It's cool to read some of this history. Thanks for sharing! wow what a different type of blog post! love it! Wow - this is fun information on Elvis Presley! Who knew?!? Wow. That is such a neat history lesson! Elvis was such an interesting character!